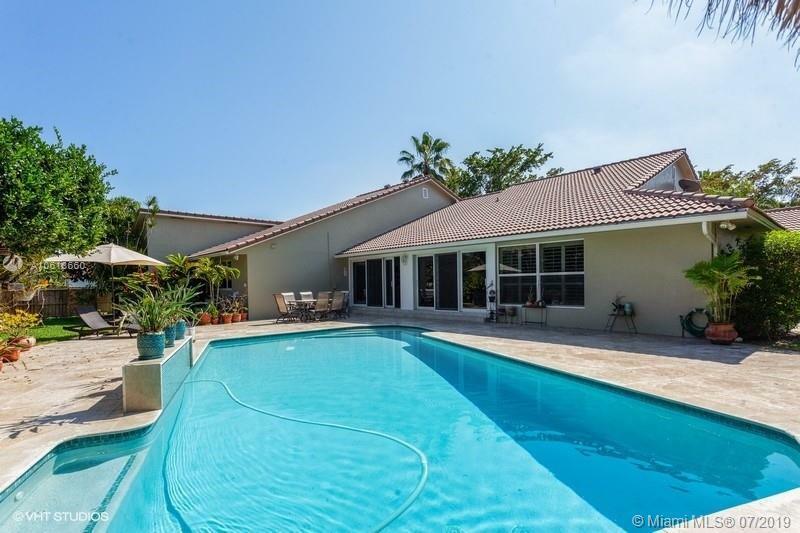 Enter beautiful impact lead glass double doors to Incomparable custom built 4 bedroom, 3 bath pool home; Totally upgraded. Elegance & quality features punctuate this beautiful home, especially the kitchen & baths; French quartz tile floors & volume ceilings are the background for this inviting home w/ newer roof, impact windows & doors, 2 Trane AC Units & fresh paint. Huge newer kitchen w/ mahogany cabinets, granite, S.S. appliances including a Red & White Wine cooler, 6 burner gas stove & grill. The kitchen opens to two family rooms, one would be ideal for Home Theater, & sliders to private hedged yard for patio-pool & Tiki Hut dinners & enjoyment. Pool has diamond brite finish, salt system, & waterfall. All rooms are generous, great floor plan for adults & children w/their own space. Directions: Us1 South To 152 St Turn Left To 82 Ave, Turn Right To 162 St, Urn Left To Property. Use Gps.